The HIIT Trainer Pro was added to ProForm's lineup a couple of years ago, apparently as a direct competitor to Bowflex's super popular Max Trainer. It combines an elliptical with a stepper to offer quicker results with specialized interval training workout programs. The HIIT Trainer Pro is a space-saver hybrid machine, sleek and modern looking in all black and silver with red accents. 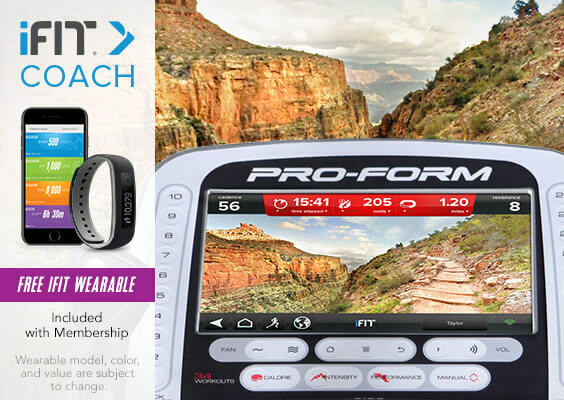 It features a bright, 10" Smart HD touch screen with all of the relevant workout feedback. The reviews on the ProForm Cardio HIIT Pro have been very positive thus far, and these hybrid machines are becoming more and more popular for several reasons. For starters, they offer a solution for those who want to target all different muscle groups while they work out, as well as burn a lot of calories in a shorter amount of time. The Cardio HIIT Pro takes the stepping machine to the next level, adding an elliptical element and reducing stress on the knees and joints. It's made for HIIT, which is a series of high intensity and low intensity interval training, which gives you maximum results during and after your workouts. Also unlike your typical stepper, the Cardio HIIT has movable arms, so it's almost like you are boxing while you step, giving you a full upper body workout in addition to the lower body. The Cardio HIIT Pro presents a direct challenge to the popular Bowflex Max Trainer, as it is very similar in the way it operates. However, this one offers a lot more in addition to the workouts themselves. 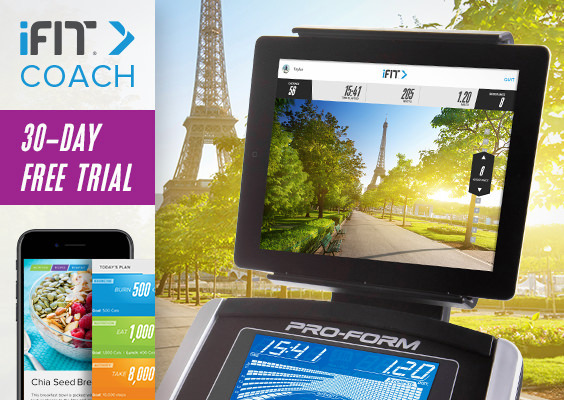 Some things the Max Trainers do not have that the HIIT Pro does: a 10" touch screen, iFit coach with unlimited programs and Google map integration, 26 resistance levels, 34 built in workouts, iPod audio and a generous warranty. So this one kind of takes the hybrid elliptical to the next level. Price wise, it gives you a little more value as well. At about $1599 on sale, it's a few $100 less than the top level Max Trainer M7. The base HIIT Trainer model is similarly priced to the base M3, at around $999. It will be interesting to see if ProForm can take away some of the market that Bowflex owns, as the Cardio HIIT models appear to have a lot more to offer. 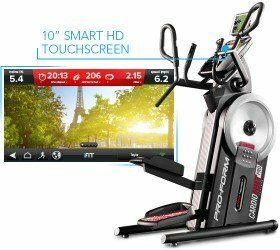 How Does the HIIT Trainer Pro Compare to the Other ProForm Ellipticals? The HIIT Trainer Pro is quite different than the traditional ProForm ellipticals, so you can't really make a head to head comparison between the two cardio machines. The base model comes with a basic 7" display, 24 different resistance levels, 32 built in workout programs, 350 lb. max weight capacity, workout fan, music port and access to iFit Coach technology via Bluetooth. The warranty is impressive: Lifetime frame, 3 years parts, 1 year labor. The up-graded model comes with 10" Smart HD touch display, 26 resistance levels, 34 built in workouts, IFit Coach via WiFi, and a stronger warranty (5 years parts) than the base model. Otherwise, it shares the same features and capabilities. Since they are both priced around $1599 on sale, the best comparison to make is between the ProForm HIIT Trainer Pro vs the Max Trainer M5. It gives you the Burn Meter Calorie display, 16 resistance levels, 9 built in workouts, Bluetooth capability and a 2 year warranty. So both the base HIIT Trainer and the Pro version have the Max Trainer M5 beat in almost every category, with more interactivity, higher max weight, more resistance levels, more workouts and a much stronger warranty. If you're deciding between a HIIT Trainer and a Max Trainer, you'll probably be a lot happier and more entertained with the HIIT Trainer. There's just much more included for the price. If budget is an issue, stick with the entry level model as it has everything you need for a calorie burning workout. However, if you can swing the extra $500, the touch screen and additional capability on the Pro version is certainly worth the additional expenditure. This hybrid machine from ProForm has just about everything you could want, so if you are in the market for a space-saving exercise machine with full body workouts and interval training, this one is a good choice. You have tons of workouts and resistance levels, iFit Coach with Google maps, iPod audio, and a 10" touch screen with internet capability. Also take a look at the base model which is very similar but without the touch screen if you want to save a little money. The Cardio HIIT Trainers from ProForm might just be the future of home exercise, and time will tell if they are able to overtake the mighty Bowflex Max Trainers. The ProForm HIIT Trainer Pro elliptical is on sale right now!